As your enterprise builds its own library of portlets for internal use, you can create your own plugin repository to make it easy to install and upgrade portlets. This will allow different departments who may be running different instances of Liferay to share portlets and install them as needed. If you are a software development house, you may wish to create a plugin repository for your own products. Liferay makes it easy for you to create your own plugin repository and make it available to others. Use the Software Catalog in the Control Panel to create the repository by using its graphical interface and an HTTP server. Create an XML file using the Liferay Plugin Repository DTD (http://www.liferay.com/dtd/liferay-plugin-repository_6_0_0.dtd) and an HTTP server. Both methods have their benefits. The first method allows users to upload their plugins to an HTTP server to which they have access. They can then register their plugins with the repository by adding a link to it via the Control Panel’s graphical user interface. Liferay will then generate the XML necessary to connect the repository to a Control Panel running on another instance of Liferay. This XML file can then be placed on an HTTP server and its URL can be added to the Plugin Installer, making the portlets in this repository available to the server running Liferay. The second method does not require an instance of Liferay to be running. You can upload plugins to an HTTP server of your choice, then create an XML file called liferay-plugin-repository.xml manually. If you make this file available on an HTTP server (it can be the same one which is storing the plugins or a different one), you can connect the repository to a Plugin Installer in the Control Panel running on an instance of Liferay. 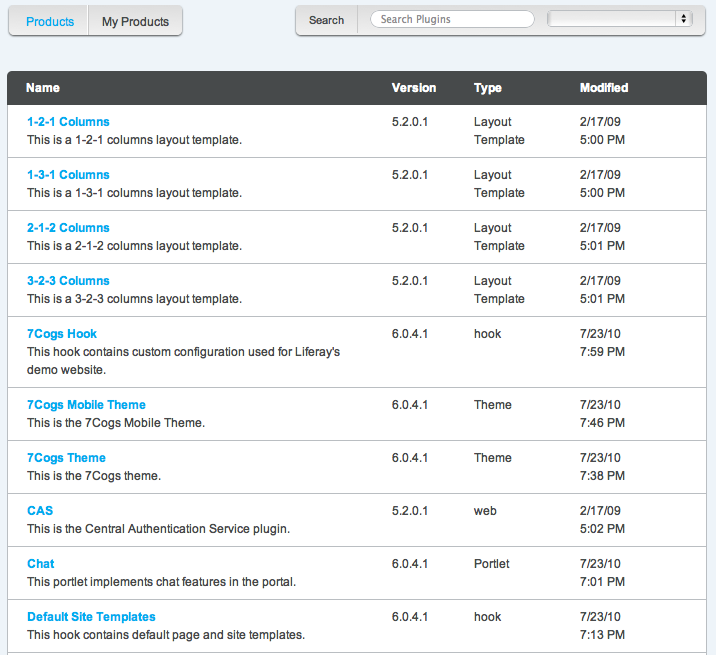 We will first look at creating a plugin repository using the Software Catalog in the Control Panel. You will want to use the Software Catalog if you will have multiple users submitting portlets into the repository and if you don’t want to worry about creating the liferay-plugin-repository.xml file yourself. Each site in your portal can have an instance of the Software Catalog. The Control Panel presents you with the software catalog for whichever site you are working on. This means different sites can have different software repositories, so you can host several software repositories on the same instance of Liferay if you wish, they just have to be in different sites. Choose the site that will host the plugin repository and go to the Control Panel. You will see at the top of the screen a message that says “Content for [Site],” where [Site] is the site you were on when you selected the Control Panel from the dockbar. If you want to administer the software catalog for a different site, you can select it from the selection box. The Software Catalog has several tabs. The first tab is labeled Products. The default view of the portlet, when populated with software, displays what plugins are available for install or download. This can be seen in the version on Liferay’s home page. We will use an example site in order to better illustrate how to use the Software Catalog portlet. Assume you, as the portal administrator, have created a site called Old Computers. This site will be for users to collaborate on setting up and using old computers with obsolete hardware and operating systems. Users who participate in the site will eventually get upgraded to a more privileged status and get their own blog page. To implement this, you have created a My Summary portlet which displays the user’s name, picture and description from his or her user profile. Because this portlet is generic enough that it could be useful to anyone using Liferay, you have decided to make it available in your own software catalog. The first step in adding a plugin to your software repository is to add a license for your product. A license communicates to users the terms upon which you are allowing them to download and use your software. Click the Licenses tab and then click the Add License button that appears. You will then see a form which allows you to enter the title of your license, a URL pointing to the actual license document and check boxes denoting whether the license is open source, active or recommended. When you have finished filling out the form, click the Save button. Your license will be saved. Once you have at least one license in the system, you can begin adding software products to your software catalog. Click the Products tab, then click the Add Product button. Your next step will be to create the product record in the software catalog. This will register the product in the software catalog and allow you to start adding versions of your software for users to download and/or install directly from their instances of Liferay. You will first need to put the .war file containing your software on a web server that is accessible without authentication to the users who will be installing your software. In the example above, the Old Computers site is on the Internet so you would place the file on a web server that is accessible to anyone on the Internet. If you are creating a software catalog for an internal Intranet, you would place the file on a web server that is available to anyone inside of your organization’s firewall. 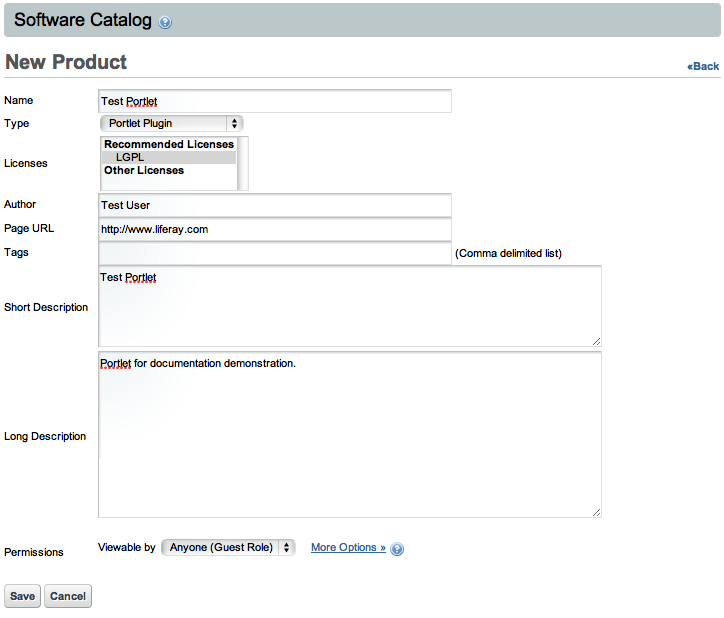 To create the product record in the Software Catalog portlet, click the Products tab, then click the Add Product button. Fill out the form with information about your product. Name: The name of your software product. Type: Select whether this is a portlet, theme, layout template, hook or web plugin. Licenses: Select the license(s) under which you are releasing this software. Author: Enter the name of the author of the software. Page URL: If the software has a home page, enter its URL here. Tags: Enter any tags you would like added to this software. Short Description: Enter a short description. This will be displayed in the summary table of your software catalog. Long Description: Enter a longer description. This will be displayed on the details page for this software product. Permissions: Click the Configure link to set permissions for this software product. Group ID: Enter a group ID. A group ID is a name space which usually identifies the company or organization that made the software. For our example, we will use old-computers. Artifact ID: Enter an Artifact ID. The artifact ID is a unique name within the name space for your product. For our example, we will use my-summary-portlet. Screenshot: Click the Add Screenshot button to add a screen shot of your product for users to view. When you have finished filling out the form, click the Save button. You will be brought back to the product summary page and you will see your product has been added to the repository. Notice in the version column, N/A is being displayed. This is because there are not yet any released versions of your product. To make your product downloadable, you need to create a version of your product and point it to the file you uploaded to your HTTP server earlier. Before you do that, however, you need to add a Framework Version to your software catalog. A Framework version denotes what version of Liferay your plugin is designed for and works on. You cannot add a version of your product without linking it to a version of the framework for which it is designed. Why is this so important? Because as Liferay gains more and more features, you may wish to take advantage of those features in future versions of your product, while still keeping older versions of your product available for those who are using older versions of Liferay. This is perfectly illustrated in the example My Summary portlet we are using. Liferay had a My Summary portlet of its own, which does exactly what we have described here. This portlet was added to the suite of portlets which Liferay provides in the Social Networking plugin. This plugin makes use of the many social networking features which have been added to Liferay. So rather than just displaying a summary of your information, the Social Networking portlet adds features such as status updates, a “wall” for each user in his or her profile that other users can write on, the ability to become friends with other users?? ?thereby granting them access to their profiles?? ?and more. None of this would work in older versions of Liferay, because the core engine that enables developers to create features like this is not there. So in this case, you would want to keep the older My Summary portlet available for users who have not yet upgraded and make the newer social portlets available to those using latest version of Liferay. This is what Framework Versions does for you. If you connect to Liferay’s software repositories with an old version of Liferay Portal, you will see the My Summary portlet. If you connect to Liferay’s software repositories with new version of Liferay, you will see the social portlets. So click the Framework Versions tab and then click the Add Framework Version button. Give the framework a name, a URL and leave the Active check box checked. For our example, we have entered 6.0.3 for the name, because our portlet should work on that version and higher, and http://www.liferay.com for the URL. Click Save. Now go back to the Products tab and click on your product. You will notice a message is displayed stating the product does not have any released versions. Click the Add Product Version button. Version Name: Enter the version of your product. Change Log: Enter some comments regarding what changed between this version and any previous versions. 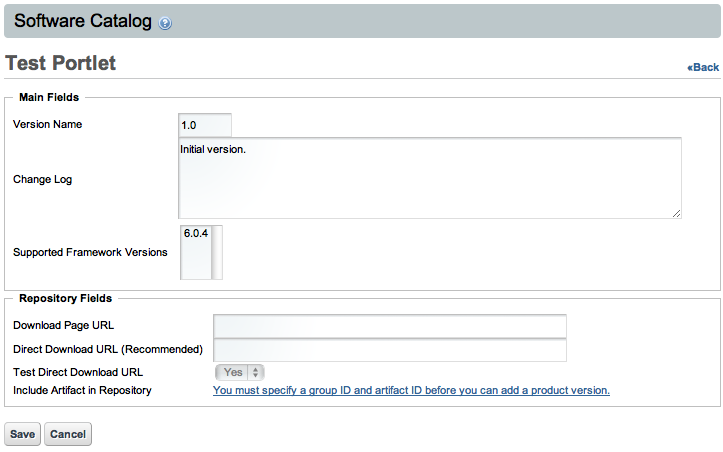 Supported Framework Versions: Select the framework version for which your software product is intended. Enter a + at the end of the version number if you want to specify a version plus any future versions. Download Page URL: If your product has a descriptive web page, enter its URL here. Direct Download URL (Recommended): Enter a direct download link to your software product here. The Plugin Installer portlet will follow this link in order to download your software product. Include Artifact in Repository: To enable others to use the Plugin Installer portlet to connect to your repository and download your plugin, select yes here. When you are finished filling out the form, click the Save button. Your product version will be saved and your product will now be available in the software repository. The Software Catalog works by generating an XML document which the Plugin Installer reads. Using the data from this XML document, the Plugin Installer knows where it can download the plugins from, what version of Liferay the plugins are designed for and all other data about the plugins that have been entered into the Software Catalog portlet. In order to get your Software Catalog to generate this XML data, you will need to access a particular URL. If you have created a friendly URL for your site (for example, the default site, which is called guest, has a friendly URL of /guest already configured for it), you can use the friendly URL. If not, you will first need to know the Group ID of the site in which your Software Catalog portlet resides. You can do this by accessing the Manage Pages interface and looking at the URLs for any of the pages. The URL will look something like this: http://localhost:8080/web/10148/1. Obviously, it is much easier if you are using Friendly URLs, which we highly recommend. You can now give the URL to your software repository out on your web site and other administrators of Liferay can enter it into the Plugins Installation module of their Liferay Control Panels to connect to your repository. If you want to serve your repository off of a static web server, you can save this document to a file called liferay-plugin-package.xml and put this file on your HTTP server. You can then give out the URL to the directory which holds this file on your web site and anyone with an instance of Liferay will be able to point their Plugin Installer portlets to it. As you can see, the Software Catalog makes it easy for you to create a repository of your software. Users of Liferay can configure their Plugin Installers to attach to your repository and the proper versions of your software will be automatically made available to them by a single click. This is by far the easiest way for you to keep track of your software and for your users to obtain your software. Another benefit of the Software Catalog is that you can make available to your users a standard interface for manually downloading your software. For those who prefer to manually download plugins, your Software Catalog gives them an interface to go in, find your software either by browsing or by searching, preview screen shots and download your software?? ?and you don’t have to build any of those pages yourself. Simply configure your software in the portlet and all of that is done for you. How can you do this? The Software Catalog is also available as a portlet. You can add it to any page on your web site through the Add Application menu. You can find the portlet in the Tools category. If you do not wish to use the Control Panel to create your software catalog, you can create it manually by manually typing out the XML file that the Software Catalog section of the Control Panel would normally generate. Note that if you do this, you will not be able to use the Software Catalog portlet as a graphical user interface to your software that end users can use to download your software manually: you will have to build this yourself. Keep in mind many instances of Liferay Portal sit behind a firewall without access to the Internet. Because of this, if you are making your software available to Internet users, some of them will have to download it manually anyway, because their installations are firewalled. In this case, the Software Catalog portlet is the easiest way to provide a user interface for downloading your software. If you still wish to use a text editor to create your software catalog, you can. To manually create a software catalog, obtain the DTD for the XML file from Liferay’s source code. You will find this DTD in the definitions folder in the Liferay source. It is a file called liferay-plugin-package_6_0_0.dtd. Use this DTD with a validating XML editor (a good, free choice is jEdit with all the XML plugins) to create your software catalog manually. If there is a software catalog of plugins you would like to point your instance of Liferay to, all you need is the URL to the catalog. Once you have the URL, go to the Plugin Installer in your Control Panel and click the Configuration tab. You will see there are two fields in which you can enter URLs to plugin repositories: Trusted Plugin Repositories and Untrusted Plugin Repositories. Currently, the only difference between the two is to provide a visual cue for administrators as to which repositories are trusted and untrusted. Enter the URL to the repository to which you wish to connect in one of the fields and click Save. The portlet will connect to the repository and items from this repository will be shown in the list. If all this talk of catalogs has put you in the mood to do some shopping, then it’s probably a good time to get acquainted with Liferay’s Shopping application. Let’s go down that aisle next.